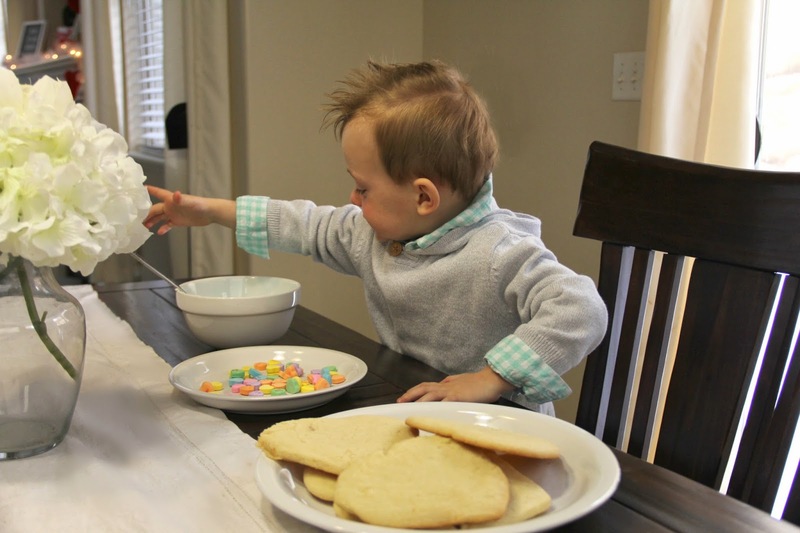 If you know me personally, and have witnessed my little man Cayman and I’s relationship, you KNOW how much we love baking together. Cayman is my little chef. He will run to the sink; wash his hands, put on his little apron and say, “mommy lets make a snack!” I think we will be paying for culinary arts school in the future. 😉 One tradition I have every year is making valentines cookies for our neighbors. 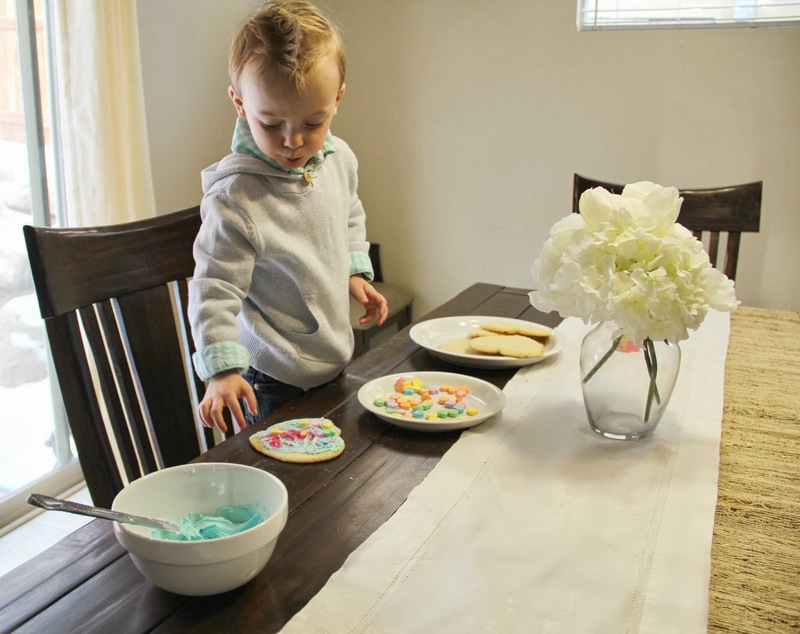 This year Cayman was very excited to make them with me (as you can see by his picture) If you are a mom of little ones over 2 1/2, this is the perfect Valentines activity for the both of you. 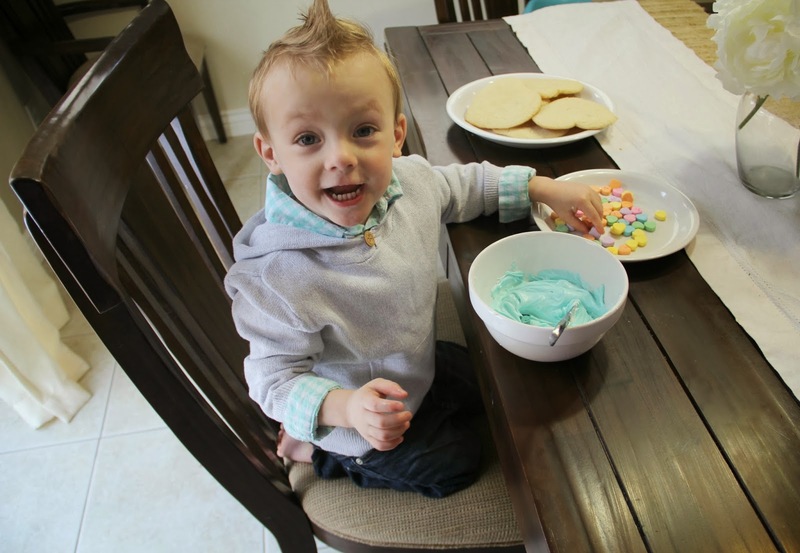 I let Cayman pick the color of the frosting, stir it, put the sprinkles on, and he was in heaven! Not exactly the healthiest snack, but Valentines cookies are always an exception. 2.Combine sugar, butter, sour cream, eggs, and vanilla extract. Beat for 3-4 minutes. 3. Add dry ingredients and mix until dough forms, it will be sticky and wet. Put the dough in the refrigerator to chill for about 30 minutes. 5. Bake for about 8-10 minutes. Cookies should be light golden brown, remember if they look like they are not quite done, they will keep baking once they are out. If you like your cookies crunchy, bake them a little longer. speed for a minute or two until light and fluffy. desired, and beat until combined. Combine sour cream, sugar, butter, eggs, and vanilla/almond extract. Beat for 2-3 minutes. just bake them a little longer. creaming until well blended. Add salt, vanilla, and whipping cream. That sweater is amazing. The pink shoes and the pink stripe on the back of the sweater works SO WELL with each other! Great look 🙂 Cayman is such an adorable little boy. 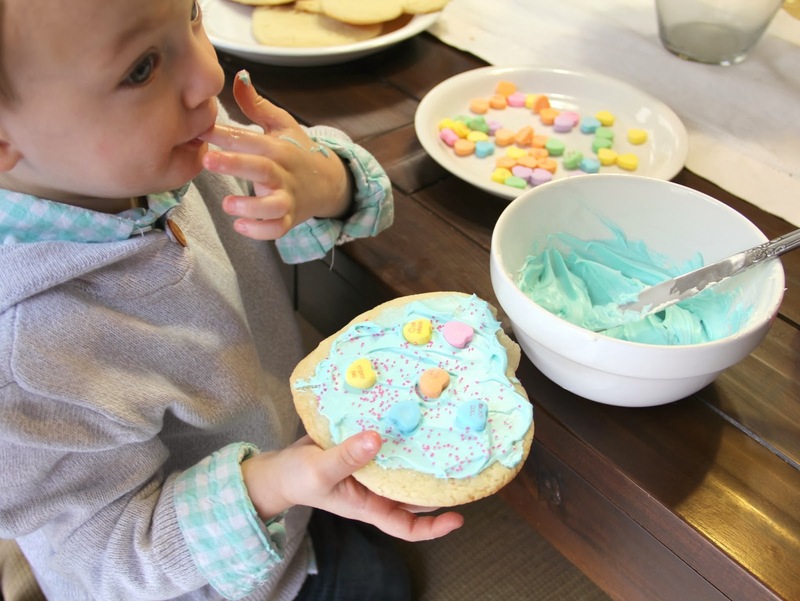 What a wonderful cookie helper! Love the bag and your pink heels! Stopping by from the link up. I want that shirt!! I love the pop of color in the back, and the coordinating shoes! You look flawless, seriously! The bag, the colors, the back detail on the sweater – it's amazing! And I'm loving the his and hers gingham in the baking photos! He's adorable! This is by far one of the best outfits I have seen yet! So pretty!! 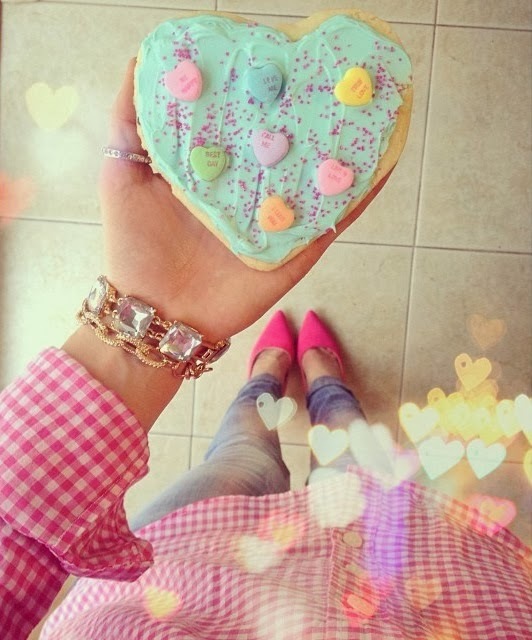 Love the pops of hot pink and the adorable sugar cookies look so yummy!! I love this outfit! 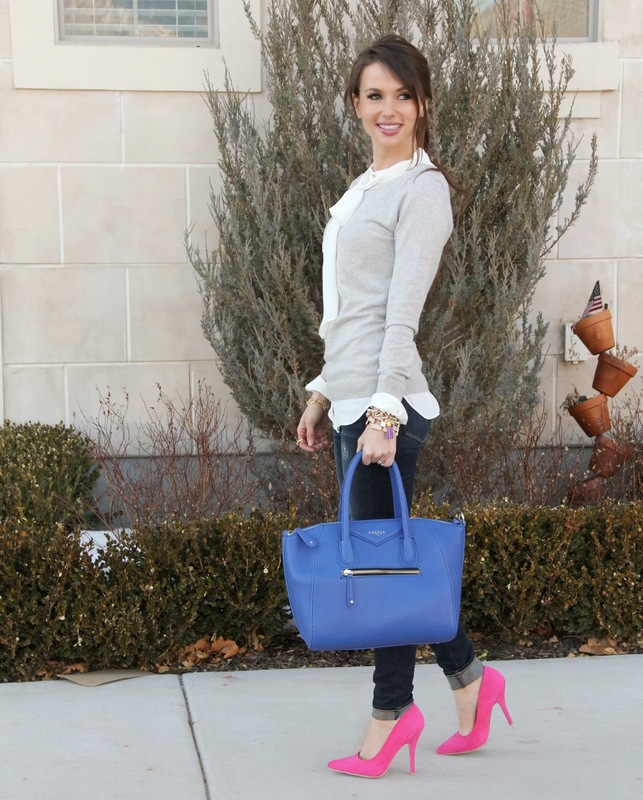 The shoes, the sweater, the bag…beautiful! Just followed you on bloglovin, can't wait to see more! I love the pink zip on your jumper! Visiting from Because of Jackie! I adore this outfit. I have a top like that that I'm going to have to try this with. And those cookies look yum! What an adorable outfit and adorable son! I like to spike up my son's hair too. 🙂 Love your blog, would appreciate any tips you can give me on mine. I'm new to this blogging world and loving it already! I love the pops of pink!! lovely blog!! follow each other? Oh, I love the pink zipper on the back of your shirt! That's such a cool detail! Absolutely gorgeous! Love the zipper detail of the sweater! And now I want a cookie…… 🙂 Thanks for linking up with What She Wears! You look SO gorgeous in this, I LOVE the pink heels and the piping on your top when you turn around. Love! You're darling and I love your style! 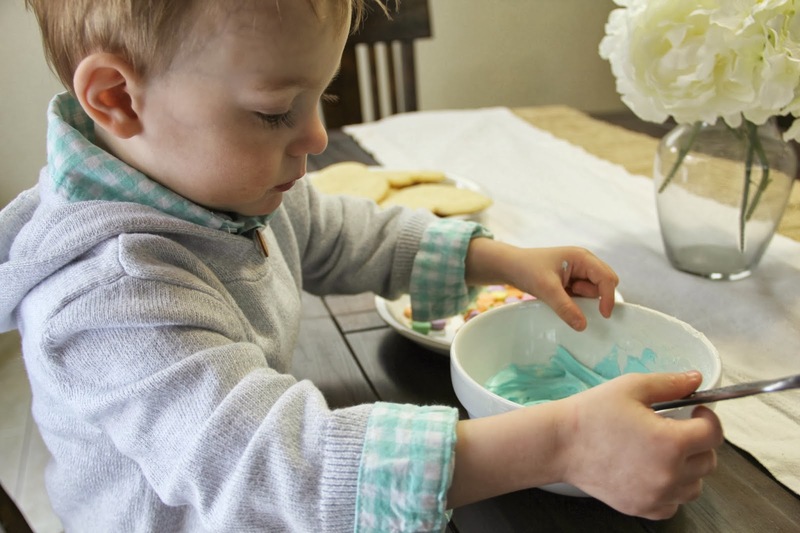 Thank you so much for linking up to the Be.You.Tiful Link Party!